Bold Souls, 'Glasgow's monthly fashion network' has just been brought to my attention. Bold Souls offers monthly events where designers, retailers, bloggers, and fashionistas can get together and play dress up. Les Garcons de Glasgow also make an appearance to photograph the stylish results. Bold Souls is a unique pop-up fashion and styling event in Glasgow, aiming to promote independent design throughout Glasgow and connect creatives working throughout the city. Bold Souls aims to nurse the fashion community within Glasgow. With so much talent within the city we feel the best way to show it is by inviting some of our favourite designers to come showcase under one roof – giving you the opportunity to buy direct from the designer (sans shop overheads) and learn more about the creative pool we have in Glasgow at the moment. Bold offers designers the opportunity to network with like-minded folk within the city, to help build up on collaborations. Bold Souls brings everything you need under one roof – designers, models, photographers, bloggers and stylists. I'm sold. With the demise of Che Camille, I was looking for some good fashion news. 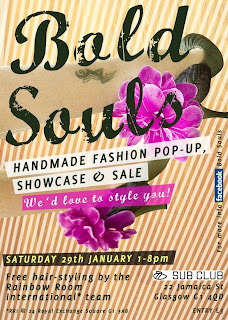 The next Bold Souls event takes place on 29 January from 1 to 8pm at the Subclub. Tickets £2 in advance, £3 on the door.